Want to know the 5 reasons you can’t stick to your diet? And what to do instead? This is it… but this is not a ‘diet’ as you know it. The fact is, if you are looking for someone else to tell you what, when and how much to eat then you are looking in the wrong place. The truth is, you actually have the answers in you. Your body communicates with you all the time, but often we are too busy to tune in, or we’ve unlearnt how to, or we’ve followed so many diet rules we’ve lost the skills we need to tune in to our bodies. As a baby you knew exactly when to eat and when to stop without an internal battle about what you should be eating, and you can learn to eat this way again. Imagine for a minute how it would feel to lose the food rules and the battle between want and should. 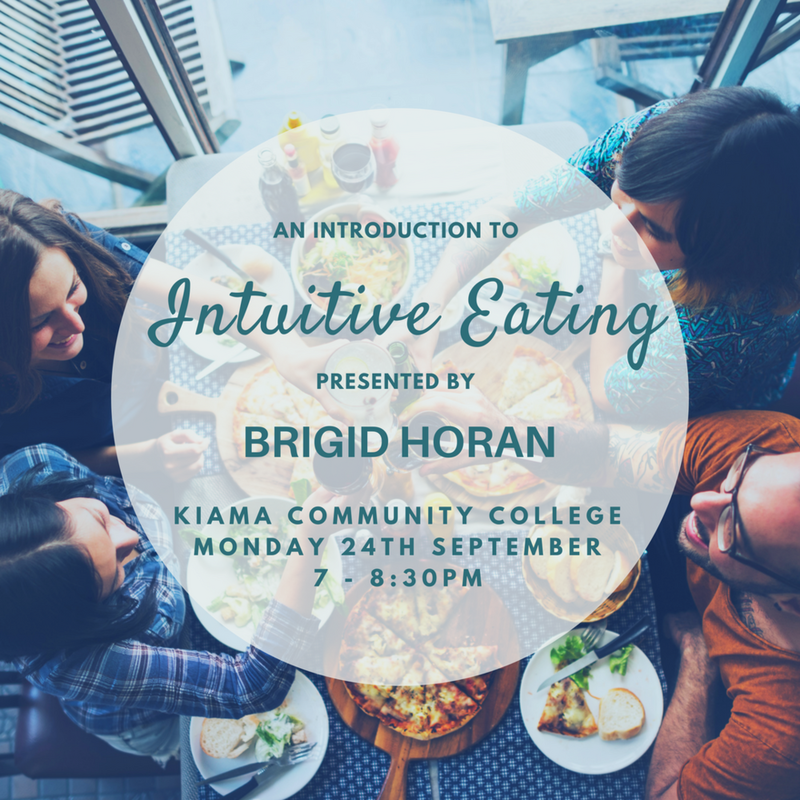 Come along to this 90 minute workshop to unlearn diet thinking and learn the 10 principles of intuitive eating to help you make healthy and satisfying food decisions and build trust in your own body. Put simply, this workshop will help you to lose the diet mentality and learn how to trust your body to tell you when, what and how much to eat. Numbers are limited. CLICK HERE FOR TICKETS! How often do you think about food every day? Do you have an internal battle going on about in your head about what you want to eat versus what you should eat? Have you dieted and lost weight but then regained some or all of the weight. Maybe you gained more weight than when you started? Do you feel overwhelmed and confused about all the nutrition messages we see? Would you like your kids to have a healthy relationship with food and their bodies? Research shows that in the long term dieting is more likely to lead to weight gain than weight loss. My name is Brigid Horan I have been a dietitian for 16 years and have worked in weight loss and weight loss surgery and have seen this first hand. Recently I have trained as an Intuitive Eating Counsellor as I strongly believe Intuitive Eating is the answer. Intuitive eating is not the hungry full diet, it is a well defined evidence based model that can improve our relationship with food and our body, promote health and stabilise our weight. Imagine for a minute how it would feel to lose the food rules, the confusion and the battle between want and should and learn how to trust your body to tell you when, what and how much to eat. Parenting today presents many challenges. For many of us, feeding our children can be a key source of stress and dinner time is an ongoing battle. When we become parents we are not taught how to feed our children, and almost everything written about feeding kids focusses on what to feed them, not how. Many of us automatically fall back on how we were raised, or we react to fears such as the fear of our child being 'too small' or 'too big', which can lead to unhelpful feeding habits. In this 90 minute session we will focus on how to feed kids in order to raise an intuitive eater. Why raise an intuitive eater? As a dietitian, an Intuitive Eating Counsellor and a mum of three, I believe it is the best way to raise kids to have a healthy relationship with food and their body. Children who are intuitive eaters have a relaxed approach to meal times and mostly eat according to their internal cues of hunger and fullness. That is, they trust their body to tell them when to eat and when to stop. They eat a more varied diet and are more willing to try new foods. They are also less likely to diet as they get older which is associated with the onset of eating disorders and poor body image. Sharing a meal with an intuitive eater is (mostly!) a relaxed enjoyable experience and this continues to foster a healthy relationship with food and facilitate a close family connection. If this sounds appealing then please join us to find our how you too can achieve this for your family.